Tonbridge earned its reputation as a printing town in the first half of the twentieth century, after two London printers, Bradbury and Agnew (later the Whitefriars Press) and Truscott and Son (later the Dowgate Press), set up 'country' branches here. Both firms prospered, and were joined by others until the industry eventually employed about 1000 people in the town. 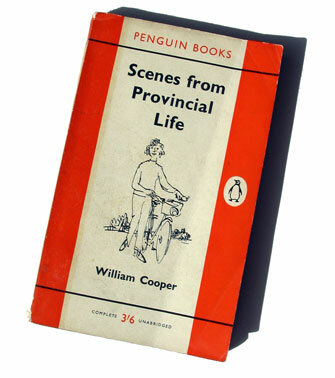 At one stage up to two million Penguin books a year were being printed in Tonbridge. The Whitefriars Press was Tonbridge’s largest employer in its day. The firm had been founded in the 1820s in the Whitefriars district of London, and went on to print and publish the famous Punch magazine. The Tonbridge operation started in 1896 in a three-storey former warehouse in Medway Wharf Road. Book production began, using paper brought up by barge from the Medway towns, and new buildings were soon added adjacent to the original one as work expanded. The premises eventually occupied more than an acre. A catastrophic fire made national headlines in 1926 and destroyed half the factory, but allowed the firm to rebuild and re-equip the works as an up-to-date printing establishment. By the late 1940s Whitefriars, with 300-350 employees, was specialising in high-class multi-colour work, catalogues, and book production of every description. The Whitefriars Wharf housing development now occupies the site and to some extent mimics the look of the former print works. At the other end of the town, work on the new Dowgate Works for the other large-scale printer, Truscott’s, began in the Meadow Lawn area in 1900. There were several subsequent expansions, and about 250 people were employed there by 1937. The works was further extended and modernised after an air raid in 1941 had totally destroyed one of the firm’s London sites, and eventually covered 2.5 acres. In the late 1940s the firm’s output included high-class colour printing in letterpress and by lithography, and the production of cheques, account books and other stationery. The site was sold in 1988 and the works demolished, to be replaced by new housing in Amberley Close and Arundel Close. For a century before the big firms came, small-scale jobbing printers worked in High Street premises to meet local needs for handbills, programmes, timetables, business stationery and much else. One of them was Bridger’s, started by William Bridger in 1830 when he took over the print works of Thomas Dakin at 131 The Terrace (later 163 High Street). By the 1840s his services included printer and bookseller, news vendor and binder. The business stayed in the family right up to 1967 after which the premises became a book shop and later a restaurant. Another printer, Stonestreet, operated as a family business from 25 High Street until about 1937. Stonestreet was a printer and bookbinder, stationer and newsagent, and for a time housed the offices of the Tonbridge Telegraph newspaper. 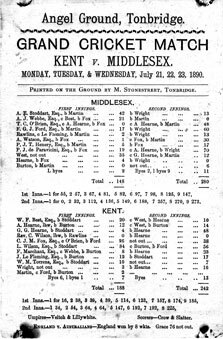 The premises had rear access to the Angel Cricket Ground enabling Stonestreet’s to print and sell up-to-the-minute scorecards on the Ground. The premises now house a shoe repair business. More information about printers and many other industrial undertakings in the town can be found in the book Tonbridge's Industrial Heritage, published by Tonbridge Historical Society and available in the Public Library, or to purchase from MR. BOOKS, 2 Bank Street, Tonbridge (website).